Dewitt House Ithaca – Mixed Use Development with Lifelong. Mixed Use Development with Lifelong. 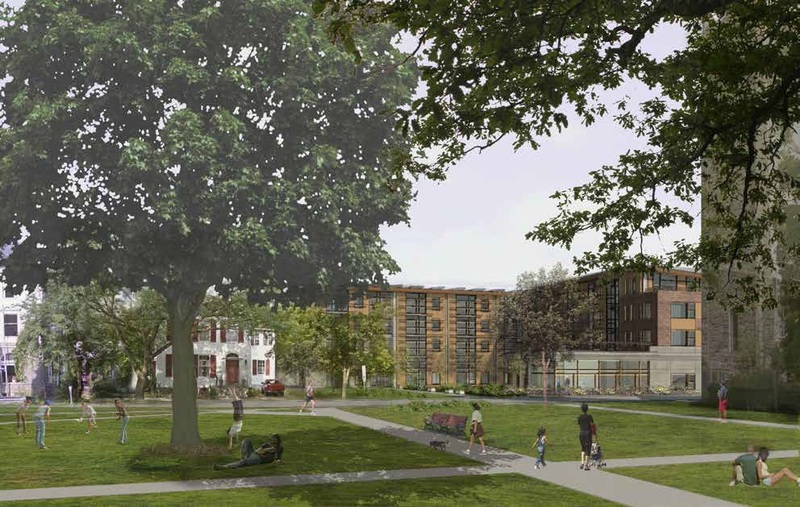 Travis Hyde Properties assembled a team for the DeWitt House project, submitting a proposal in response to Tompkins County’s request for proposals to redevelop the Old Library site in Ithaca. For the full project proposal and other documents CLICK HERE. Our team’s proposed redevelopment project, led by Travis Hyde Properties in a partnership with Lifelong (TC Senior Citizens Council, Inc.), is to create a mixed-use development that looks comprehensively at the potential benefits of the site. The Old Library site is repurposed and combined with Lifelong’s property holdings to leverage a larger development that provides for greater green space and a public/ private community asset that still fits comfortably within the mixed neighborhood context. The building occupancies will include new and expanded facilities for Lifelong on the ground floor, senior-focused housing on three upper floors in 60 one- and two-bedroom apartments, and professional office space at street level. 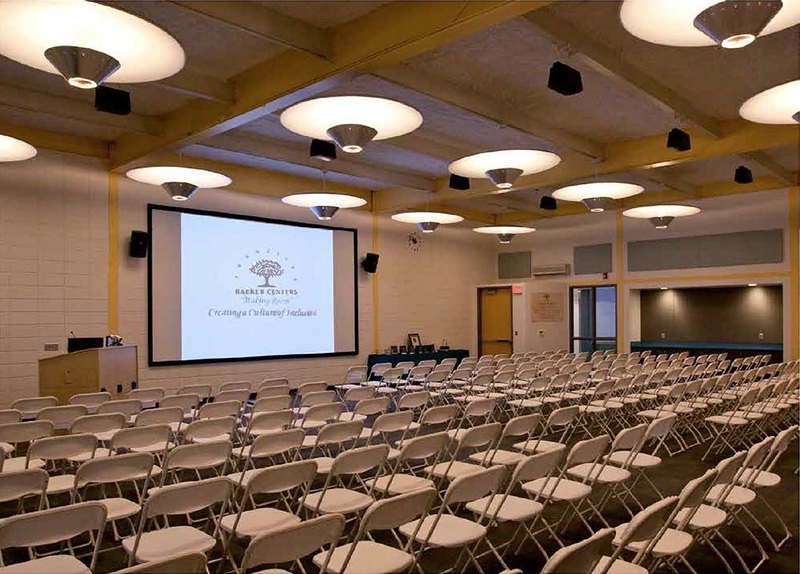 In addition, amenities for the building occupants in the form of a fitness center and community room are provided. The community room will also be available for public use, similar to the function of the community room at the Women’s Community Building. Tucked into the wings of the building is a green space dedicated to community gardens for the residents, but also to be used for Lifelong outdoor programs and with views into and out to DeWitt Park. It is expected that the public will be invited to stroll the garden as an extension of the Park. 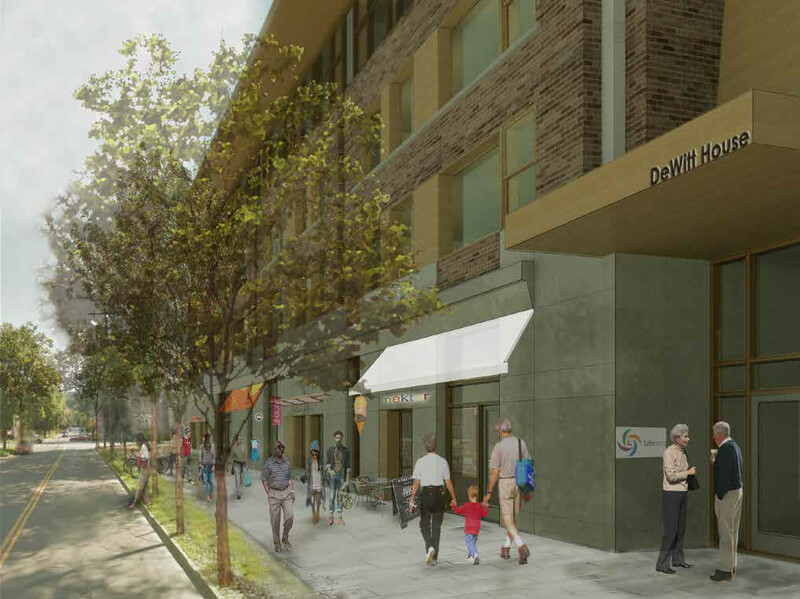 The fully accessible building with limited on-site parking and community gardens linked to Dewitt Park will welcome Tompkins County seniors into a nurturing haven of mid-market housing conveniently connected to a wealth of senior activities at Lifelong and pedestrian-friendly downtown living. This proposal is to purchase the Old Library property from Tompkins County at fair market value and deconstruct the Old Library and existing Lifelong 1-story building at 119 W. Court Street to create a new 4-story 72,500 gross square foot sustainably-designed, mixed-use building. The 2-story building at 121 W. Court Street remains as an “annex” to the new development, with the intended purpose of providing a place to stay for families visiting relatives in the new apartments. Our decision-making process leading up to this proposal included the analysis of costs, benefits and liabilities for several different options including the renovation of the property. We assessed the ability to create an efficient, financially viable and sustainable building for Senior Living through either renovation or reconstruction and decided that the short-term impact of new construction is offset when compared to the extensive renovation that the Old Library will have to undergo in order to adapt it into an efficient mixed-use facility. Combined with the potential for leveraging other City and County sustainable developments the proposal taps a larger sustainability goal than keeping the existing building allows. This approach is discussed in more depth throughout the proposal. By partnering with Lifelong, the project has the ability to manage and mitigate impacts to its surroundings much more than a typical urban construction. Because Lifelong’s property on the interior of the block is available during construction, material deliveries, staging, storage, etc. can be contained to a greater extent and not impact vehicular and pedestrian traffic. Also, working from the perimeter to the interior of the block can help allow the building to be a buffer for sound migration past a point in construction. The partnership of Lifelong and Travis Hyde Properties continues the commitment of the local developer and development team to community support and enhancement. Travis Hyde Properties, along with design team partner HOLT Architects, have individually and collectively shaped much of the built environment of the County and Upstate region for decades. Supported by local design team members TG Miller Engineers & Surveyors, Trowbridge Wolf Michaels Landscape Architects, Elwyn & Palmer Structural Consultants, plus specific expertise consultants Delta Engineering (MEP, CHP), Ithaca Carshare (alternative transportation) and Esther Greenhouse (environmental gerontology) the team has a long, proven track record of successfully designing, building and financing projects in our community. Added to the combined design expertise of the team is the ability of Travis Hyde to manage the property locally.